– The Kings fell to 15-15-4 against the Western Conference this season. Los Angeles is now 8-10-3 against the Pacific Division. – Los Angeles fell to 45-37-21 all-time at home against the Oilers and 84-84-39 overall. 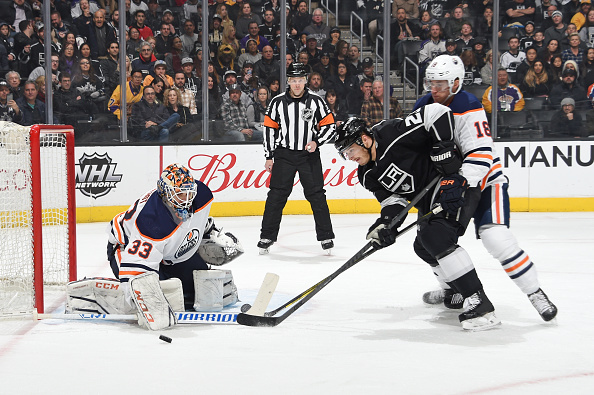 – Edmonton’s win at the Kings snapped a 12-game losing streak in Los Angeles. The Oilers last won at Staples Center on Nov. 3, 2011. – Forward Jeff Carter played in his first game since he suffered a deep cut on Oct. 18 that required surgery to repair a tendon in his ankle. He played 17:36 and fired four shots on goal while winning 69 percent of his faceoffs. – Forward Tyler Toffoli recorded his 20th goal of the season, the third time in his career he has reached the 20-goal mark. – Forward Tobias Rieder scored his ninth goal of the season, and first since being acquired by the Kings last Wednesday. He played a total of 16:24 and fired six shots on goal. – Forward Dustin Brown scored his 18th goal of the season, tying his total from 2012-13. That was the last time he reached the 18-goal mark. – Forward Anze Kopitar registered his 40th assist of the season. It is the fifth consecutive season where he has reached the 40-assist mark and 10th time of his career. – Forward Nate Thompson picked up his second assist since he was acquired by the Kings. He played 12:13 total. – Defenseman Drew Doughty notched his 34th assist of the season. – Forward Adrian Kempe notched an assist. He has four points in his last four games. – Oilers forward, and former King, Michael Cammalleri notched three assists, which where a season-high. – The Kings are scheduled to practice Sunday at 11 a.m. at Toyota Sports Center.